‘ Is there any point in leaving this world without actually seeing it ??? ‘ Its a question that always haunts me…. This trip is about one such occasion, which happens in your life, once in while…. Kerala is blessed with abundant beauty in the form of misty hills, backwaters, spice plantations giving the tourists, a serene natural scenery and an interesting culture. It draws in people from all over the country who come here to enjoy the lush green nature and watch sunsets on the quaint backwaters. Though, Kerala during monsoon becomes more fascinating as life springs up everywhere brushed by the fresh raindrops. One of the most exciting and intriguing things that you will get to witness during this time is the famous Neelakurinji flower. A sea of purplish blue flowers covers the munnar valleys and hills of western ghats presenting the most picturesque sigh ever. Seeing the Neelakurinji (Strobilanthus kunthiana) blossoms in their prime form is so special, because its something happens once in every 12 years. And the hype that was created over the last few months on this 12 year wait was pretty much swept away by the heavy monsoon and landslides that lashed Kerala in August. So, my decision was just to see those wonders, no matter what happens! You can witness this poetry of blossoms, mainly, in two popular locations on Munnar – the Kashmir of South India. One is the Eravikulam national park – ‘home of the popular Nilgiri Tahr’ and the other one is the infamous Kolukkumalai tea estate of Suryanelli region. And I selected the first spot, Eravikulam national park, because of the presence of surprising wildlife and so much floral diversities. It was a one day trip, but felt that the journey was too long. It is because, this time, i chose to travel by bus and in the most popular service of KSRTC (Kerala State Road Transport Corporation) – The “Minnal Express” …. The Minnal express of KSRTC connecting Munnar and Thiruvananthapuram. An 8 hour journey was all i needed to reach that awesome destination. That wasn’t a tiring journey because of the curiosity about seeing those purple blossoms of munnar. And the climate was so right for my photography sessions. A perfect sunny day! To visit Eravikulam national park, at that time, all i needed was just a 150 rs ticket through online process. So that made things easy. Bright daylight, clear blue skies, chilling atmosphere – a perfect scenario for exploring the wild neelakurinji blossoms of Eravikulam…. Entry point of Eravikulam National Park . The park was not so crowded, as i planned this trip on a working wednesday. So the scenes were so calm and clear…. “The tough offroaders of Munnar” – Waiting for the visitors to explore the refreshing spots of Munnar. “The Anamudi hills and the surrounding tea plantations of Eravikulam national park” – Anamudi peak is the highest peak in Kerala and is located inside this Eravikulam national park. Some Neelakurinji facts!!! The gorgeous Neelakurinji is a flower that has pulled tourists with its ethereal beauty for years. The blooming season of this flower is nothing less than a special phenomenon that is awaited (about 12 years) and experienced with much excitement. Neelakurinji flower in Kerala has around 40 odd varieties and its botanical name is ‘Strobilanthus kunthianus’. Local name of the flower comes from its bluish hue which translates to ‘neela’ in the malayalam language. To see the video of this Neelakurinji exploring trip, please click on the below caption……. Then a fun ride was waiting for me, there…. And the ride runs through the Kannan Devan tea plantation hills spreading across the Anamudi hills , to reach the top of this national park …. The 32-seater of Eravikulam national – The one that can assist you to reach the top of this national park, where you can spot those awesome flowers. Now, lets explore into my memories of this journey, which can amaze your eyes and refresh every minds…. Blue sky, lush green mountains, thick forests…. what more you need to get excited! Focusing into the Kannan Devan tea hills of Munnar…. Close view of those tea hills…. how beautifully they are arranged! Close view of St.John’s wort mysore flower. This plant has some anti-viral medicinal properties and is used in depression treatments. The scene of 32-seaters climbing to the top of this national park through the curvy narrow mountain roads…. The point where those buses dropping us out. From there, you can start walk and explore this amazing space without troubling the Mother nature. First spot where i located the Neelakurinji (Strobilanthus kunthiana) blossoms… Absolutely, a dream come true moment! Flowers that fall in the genus Strobilanthes, grow at an altitude of 1300 to 2400 meters. The first person to research upon this magnificent beauty was German botanist called Christian Gottfried Daniel Nees von Esenbeck. What is the most fascinating part of this flower species is that is blossoms very late. Its flowering cycle can range from once every seven years to even 16 years, which is why people eagerly wait for the neelakurinji blooming season. Kurinji flowers at a smelling, touching distance!… Blossomed for the third time in my lifetime. A precious moment to cherish in my entire life. Mainly limited to the Western Ghats and covers – the Nilgiri hills, Palani hills and the Eravikulam hills of Munnar with its colorful purple shade. Shevaroy hills in the Eastern Ghats are also blessed with the neelakurinji bloom. Even the bees and wasps were attracted by these flowers. There were quite a few big ones flying precariously close. Once again, I thanked this surrounding nature for giving us the chance to see these wonder blossoms…. More tourists coming to the scene… so excited ones!!! One of those magical moments, where you stand in awe at Mother Nature! Getting ready for the new life…. starting to adjust with the Mother Nature! Whitish in bright daylight and and violet in evening times… really, these kurinji flowers were so awesome to watch. I couldn’t stop, stop my finger tips from taking beautiful shots of these amazing kurinji flowers. Every time i focus into these flowers, i think, why they are taking so much time to have this smile??? Quarters of the tea plantation workers found in the centre of these tea hills. Some other interesting blossoms found on the way to the top…. small, pinkish smiles! ‘Kodikkurinji flowers’ (Strobilanthus urceolaris) – Another type of kurinji flowers found exclusively in the western ghats. 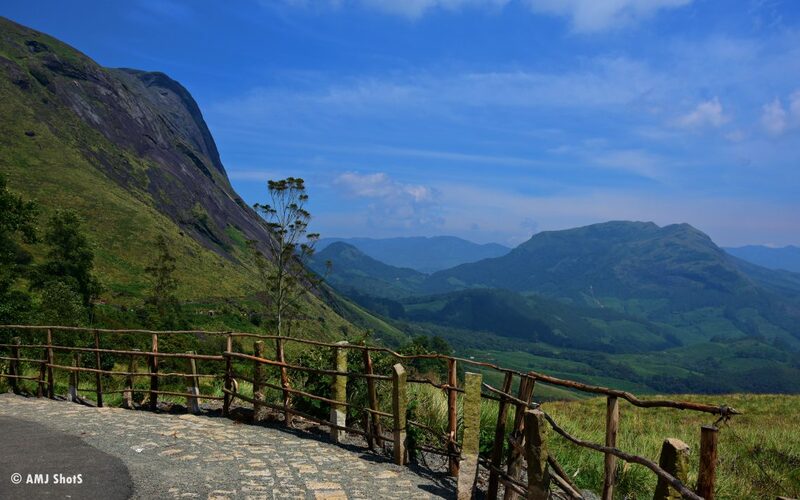 The mighty Anamudi peak of Eravikulam national park – Largest peak in Kerala with an altitude of 2695m (8842ft). Scene of tourists getting excited by the massive appearance of the Great Anamudi peak. One of my favourite shots…The Kurinji laden hills of Munnar. Such a beautiful frame, indeed!!! The scene of Eucalyptus trees – It looks like the nature has arranged them in so much discipline…. And it was the last point of this small trekking session, which had covered the hill sides. Another close view of Hypericum mysorence…. Yellow flowers and green leaves are terrific combinations, when it comes on creating beautiful photo…. what do you think??? As the day progress, the weather got cloudy and in that dim exposure, the purplish nature of these Kurinji flowers became strong. A delightful scene for the eyes!!! The famed flowers that cover hills like a sheet of purplish blue hue give Munnar a whole new look. The hill station is already well known for its mesmerizing beauty. It is a quaint haven that not only evokes a feeling of immense joy with its rolling green hills but also promises a lot of tranquility. As the evening progress, the bright clouds started to disappear and foggy air spread across the mountains. This chilling atmosphere entertained my body and decided to have some relaxation on these bamboo huts…. A stand alone eucalyptus tree and the mountains in the backdrop blended with the foggy atmosphere. A trusted good old hard worker of these tea plantations seriously doing his regular jobs. Still, he is holding up to those expectations! Yet another purple blossom – Flowers of the Cistaceae family or Rock-rose family. They aren’t special like the neelakurinjis, but that don’t really make them any less beautiful. Actually, this park is really famous for spotting one of the protected species in western ghats – the Nilgiri Tahr (Nilgiritragus hylocrius) or Nilgiri ibex. So, had decided to wait there for sometime. Thought that if i get a chance to shot the wildlife with these blossoms in backdrop, it will be awesome. I had waited there for 3 hours, but, finally, started to descend the hill with no luck of spotting the infamous Nilgiri Tahr. Patience really matters sometimes in life. Surprisingly, on my way down, the most exciting moment of this trip happened…. let’s get into it…. Spotting Nilgiri Tahr with some pretty purple blossoms around it – One of the great frames ever caught in my camera’s eyes. Its really fascinating to see this Ibex with so much blossoms decorating the scene. Now, he decided to come closer and examined me…. Why i didn’t ask him the permission to take his snap ?? ?… May be, he was thinking about it! This time, he was really really posing for it…. So, how can i resist my fingers from clicking the shutter button! Hey! don’t ask me more…. this one is final, Ok. But, was tempted to follow him for some more time. I think, he was thirsty at that time. Staring at me for following him so close…. so, that was my last shot. As, i was returning back to the entry point, got a chance to spot yet another inhabitant of this national park, the lion-tailed Macaque…..
Three lion-tailed macaques gathered on a tree… may be, it was there regular evening meeting. look at those hanging black tails, that’s their specialities…. May be, these monkeys were discussing about how the day was gone!…. Or did they discussing about me… who knows! Thats all for the day. Now, its time to say goodbye to this place. This was my second visit to this park. Got some interesting shots to make this a memorable trip. I was so much happy to witness the Neelakurinji wonders of munnar – the purplish blue smiles of western ghats. The next blooming season will be in 2030 which gives you all the more reason to check out the bloom in 2018 itself. Neelakurinji flowers which are absolutely exclusive to this place add another layer of beauty to Munnar. This captivating flower casts its magic upon those who visit Kerala during the blooming season. Scene of the Setting Sun is always perfect for ending the sweet memories of a marvellous journey. The elegant, stately hills, golden horizon spreading over the setting sun, orderly placed eucali trees, symbolizing the serene and subtle beauty that will make you return to this place again and again! As a traveler, I could nevertheless say that the glory of that Neelakurinji laden hills of Munnar was something I had never experienced anywhere else.